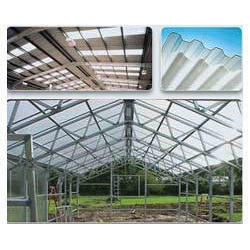 Prominent & Leading Manufacturer from New Delhi, we offer polycarbonate sheets. Polycarbonate Sheets are made up of polycarbonate polymer which is durable, high impact-resistant, low scratch-resistant and heat-resistant. With good insulation properties and excellent UV protection, these sheets are the perfect way to enhance home and outdoor living spaces. These sheets are made of polycarbonate polymers which have excellent impact resistance, light transmission properties and are light in weight. To maintain the durability of these sheets, the sheets are thick and tempered and are laminated using appropriate materials. Looking for Rainbow Polycarbonate Sheets ?